Carmelo Sortino is a former chef and pastry chef. 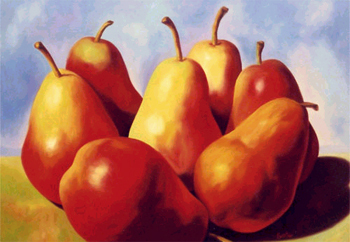 Now he works with food in a different way, painting beautiful canvases featuring fruits and vegetables. He still likes to cook, and his recipe for home made ravioli with mushroom sauce is worth the effort. With Valentine's Day ahead of us we are both consumed by a chocolate obsession this week. For a good method of tempering chocolate for dipping fruits, pretzels, etc., visit the page at Sally's Place. A look at Red Fife wheat, a heritage strain of wheat that was very important to Canada's economic development, and efforts to bring it back into vogue.